Référence bibliographique : N. Dziub et F. Toudoire-Surlapierre (dir. ), Comparative Literature in Europe : Challenges and Perspectives, Newcastle upon Tyne, Cambridge Scholars Publishing, 2019. Thanks to its historical, theoretical, and methodological dimensions, this book is unique, both in Europe and in the USA. It brings together researchers from across Europe to explain how comparative literature works, both on an institutional and a technical level, in the country in which they teach. 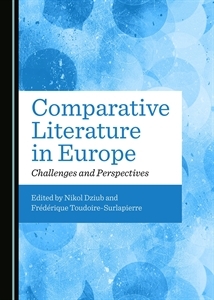 The contributions also define the characteristics of European comparative literature on a continental level. From Austria to Ukraine, by way of Belgium, Estonia, Finland, France, Ireland, Lithuania, Luxembourg, Macedonia, Poland, Portugal, Romania, Slovakia, Spain, and Switzerland, this book offers an expansive panorama, placing great emphasis on usually “invisible” countries. Moreover, it relates both to the postcolonial and post-Soviet present and to the future of comparative literature: it is a handbook, but also a laboratory. Switzerland, the Ideal Republic of Comparative Literature?